TIKI BARBER DIDN’T LIKE IT—NOT ONE BIT. He was sitting at his usual spot, on the bench in the locker room. Surrounding him were his Hidden Valley Eagles teammates, all of them hooting and hollering, psyching themselves up for the game against the Blue Ridge Bears. The game hadn’t started yet. It wouldn’t start for another ten minutes, in fact. Yet the Eagles were acting as if they’d already won! Tiki glanced over at his identical twin, Ronde. The Eagles’ star cornerback returned his sober look. They were the only two players who weren’t acting like fools. “I’m gettin’ three! Count ’em, fool,” his identical twin brother, Frank, shot back. It was weird, thought Tiki, that the Eagles had two sets of identical twins on the roster. Tiki and Ronde had purposely tried out for different positions—Tiki on offense, Ronde on defense. 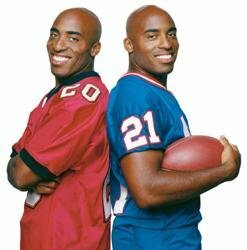 But both Amadou twins were wide receivers. That meant they had to share playing time—unless the Eagles were in spread formation. When the Amadous were both out on the field, with Tiki at halfback, quarterback Manny Alvaro was armed to the teeth with great offensive weapons. “I’m fine, okay?” The rest of the Eagles left him alone after that. They kept on joking about what a breeze today’s game was going to be. The Blue Ridge Bears hadn’t been a good team for ten years, and this season, they were even worse than usual. The Hidden Valley Eagles, on the other hand, were undefeated, and in sole possession of first place. They had been crushing their opponents for the past six weeks, and hadn’t had a really close game since week four against their archrivals, the Pulaski Wildcats. But Tiki had a long memory. He and Ronde had been through a lot during their three seasons with the Eagles. They’d even won the state championship last year. And one thing Tiki had learned was that nothing worth having ever came easy. The past six weeks had been way too easy. The Eagles were too comfortable, too confident. To Tiki, his teammates looked ready for the picking. And had they already forgotten the final score of their last game against the Bears, way back in week three? The Eagles had come away with a big, fat, one-point victory! He wanted to say something, but he didn’t want to be a killjoy. His buddies had every right to be confident—and negative thoughts were the last thing they needed before a game. The trouble was, Tiki couldn’t shake those negative thoughts out of his own head. Looking over at Ronde, he knew his twin was thinking the same thing. It happened all the time—a look they shared that meant they both knew. The look they were sharing now. The game started well enough. Ronde received the opening kick and returned it to the Bear’s twenty-five. But that’s when it all began to fall apart. The Blue Ridge defense pulled an all-out blitz on third down. Manny never saw them coming. Just as he was rearing back to throw, he got creamed from behind. Tiki tried his best to block the outside linebacker, but it didn’t matter. Manny had already coughed up the ball. Even worse, the Bears safety had recovered it and was running it back the other way for a touchdown! “Aw, man!” Tiki yanked off his helmet and had to stop himself from throwing it down on the ground. That might make him feel better, but it also might draw a stupid penalty for unsportsmanlike conduct. This was just what he’d been afraid of. All that overconfidence was gone now. He knew going in that the Eagles would be fine as long as things went well—but how would they react now, when they were staring at a seven-point gap? Ronde took the kickoff, but his blockers were overwhelmed before he could even get a runback started. The Eagle offense had to start operations deep in their own territory. Now it was up to Tiki. He told himself to hang on to the ball, keep his head down, and run straight ahead every time. The Eagles needed him to steady their offense, and he proceeded to do just that. Five straight times, Manny handed him the ball, and Tiki pushed the defense back for a grand total of seventeen yards. Finally, they had enough breathing room for Manny to go to the air. But on his first passing attempt, Felix Amadou caught his spikes on the grass and fell, just as the ball was coming his way! The cornerback was right there to grab it, and the next thing anyone knew, the Bears were driving again. Blue Ridge had played the Eagles before, and their quarterback knew enough not to throw in Ronde’s direction. They had no such respect for the Eagles’ other cornerback, Justin Landzberg. Justin was victimized twice—once on a double move by the receiver, and once when the tight end blocked him out on a cross pattern. A leap into the end zone, and one extra point later it was 14–0, Blue Ridge. Sure, it was early, Tiki reflected. Plenty of time for the Eagles to come back. But their bubble of invincibility had been pierced. The Bears had to be feeling that they could actually win this game. And that made them very dangerous. Sure enough, Blue Ridge continued to play inspired ball, dominating time of possession. The Eagle offense had gone nowhere the entire first half, when, with just over a minute left, Tiki sank to one knee in the huddle and told himself, “I’ve got to take over this game. Now.” He shot a look at Manny, and the quarterback called Tiki’s number. Tiki took the handoff and started toward the line—then did a sudden reverse and sped toward the far sideline. All day long he’d been attacking the middle, and now he’d caught the Bears by surprise. By the time they recovered and started to give chase, he’d already notched a big gain. Then he dragged two defenders ten more yards, all the way down the Bear thirty! A whoop went up from the excited Eagle offense. They’d never tried the direct-snap play except in practice. It was a trick play, to be pulled out of the bag only in an emergency. Well, this was an emergency for sure, Tiki thought as he lined up to the right of Manny, just a little closer than usual. Paco Rivera snapped the ball, and Manny pretended to grab it—but instead, it went directly to Tiki. He dashed three steps to his right, and found Felix Amadou streaking for the end zone. Tiki let the ball fly. It wasn’t a perfect spiral. Tiki hadn’t done that much throwing in the past, except back when he was a little kid. But he put enough into the throw so that only Felix could reach it. Felix’s fingertips brushed the ball, but it bounced upward as he fell. From the end zone turf, he reached back up and grabbed the floating ball before it hit the ground. Touchdown, Eagles! Adam Costa added a quick extra point, and the final seconds of the half flew by. When the Eagles got to the locker room for their fifteen-minute break, they were more relieved than confident. But soon enough, the overconfidence started making a reappearance. Tiki was fuming. He’d known this would happen! It was like he could see it coming. Yet he’d chosen not to say anything before the game. What was the matter with him? Hadn’t he learned anything these past three years? Hadn’t he watched his mother speak out and stop a factory from polluting their neighborhood? Hadn’t he seen how well his big speech to the whole school went over, once he found the courage to say it out loud, in front of everyone? These were his best friends. His teammates. Why was he so afraid to get up and speak his mind, to them of all people? This was the time. This was his last chance to say something. He told himself to get up and take the floor. He and Ronde were co-captains of the team now, after all. They had a right to address the team whenever they wanted to. Tiki looked at Ronde. Ronde stared right back at him. Tiki understood that they each wanted the other to speak first. The seconds went by. People started conversations with one another. Kids cleaned their cleats or adjusted their padding. Some went to use the restroom. Maybe he didn’t need to say anything, Tiki thought, looking away from Ronde. After all, they were only seven points down now . . . and if he spoke to the team too often, they might stop paying attention. He thought of the story of the boy who cried wolf so often that, when a real wolf appeared, no one listened to his warnings and the wolf ate all their food. The band came off the field, their halftime performance done. They crowded past the team in the locker room, on their way to the music room where they would store their instruments. Halftime was over. It was time to strap their helmets back on and take the field again. “Why didn’t you say anything?” Ronde muttered to him as they headed for the field. “Why didn’t you?” Tiki shot back. It wasn’t really an answer, but then, Ronde didn’t have one either. The moment had passed, and neither team captain had seized it. Tiki only hoped it didn’t cost them later on. The opening kickoff was a disaster. Just like in the first half, the Bears caught the Eagles flat-footed. The returner was small and had good moves. The Eagles were flying at him, but they were missing sure tackles! Before they knew it, the little guy was in the end zone, spiking the ball and doing a war dance. He got penalized for clowning around too much, but who could blame him for celebrating? He and his team were on the verge of handing the mighty Eagles their first defeat of the season! Ronde took the kick, and got fifteen yards out of the runback, which was the best he’d done since the opening kickoff. Manny handed off to Tiki a couple of times, but the Bears were waiting for him, and the gains were small. Third down and nine, and Coach called a pass play, naturally. The only problem was, the Bears knew it was coming, and they sent everyone straight at the quarterback. Manny got the pass off, but Tiki and Luke Frazier, the fullback, weren’t able to stop the third blitzer. Manny got hit, and his head slammed right into the turf. 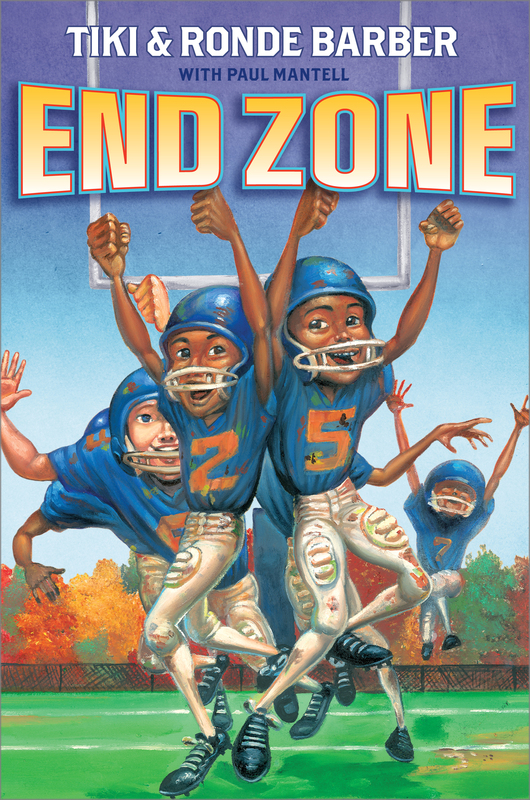 The Bears trotted back to their huddle, but Manny remained on the ground. Tiki ran over and knelt by his side. Soon they were surrounded by worried Eagles, including Coach Wheeler, the offensive coach, and the team trainer. The trainer helped Manny up into a sitting position and stared hard into his eyes. “You okay, son?” he asked. “I’m fine,” Manny said, but he sure didn’t look it. His eyes were crossing and uncrossing, and he looked like he was going to do a flop any second. “No!” Manny protested, trying to stand up but having to lean on Tiki for support. “I can play. Coach, tell him I can play,” he begged Wheeler. “Sure thing,” Wheeler told him, but Tiki could tell he was lying. Wheeler stared after Manny as the stretcher was taken off the field. The fans applauded, but they sure looked worried. And Tiki knew it wasn’t just Manny they were worried about. Without their regular quarterback, could the Eagles come back from fourteen points down? “Maybe he’ll be back,” Paco said hopefully. “But Coach—!” Paco and some others started to protest. Tiki blew out a breath as Hayden Brook, a seventh grader who had a lot of talent but who had hardly played all season, came trotting out onto the field. Tiki saw his eyes before he pulled his helmet on. Hayden had the look of a deer in the headlights. “No,” most of the kids said, but not really loud. “Yeah!” they said, a little louder this time. “Yeah!” It was a real shout this time. They clapped in unison, and broke the huddle. From that moment on, the Eagles mounted a long, grinding comeback. Tiki ran the ball more times than he ever had in a single game. He only got three, four yards most carries, but somehow, he kept their drive going all the way to the end zone. After the extra point, it was 21–14, Blue Ridge. Only seven points to make up! That seemed to inspire the Eagle defense. They rose up to stop the Bear attack, and handed the ball right back to the offense. Hayden kept on giving Tiki the ball, and Tiki kept on running like a man possessed. He logged fifty-nine yards on the drive! Hayden ended up throwing only once, and it took Blue Ridge by surprise. Even Jonah James seemed surprised as he caught the ball for the touchdown. After the game-tying extra point, it fell to Ronde to save the game for Hidden Valley. So many times over the past two and a half seasons, he’d pulled the Eagles’ bacon out of the fire. Game after game, he’d stretched his small frame to the limit, intercepting or knocking away a pass, saving a sure touchdown. Now that he’d finally hit his growth spurt and caught up to Tiki’s size, his stride was longer, he could leap higher, and his longer arms could reach balls that used to elude him. Now, in the game’s final minutes, when he saw the Bear quarterback about to throw to the other side of the field, Ronde made a quick decision. He left his man uncovered. Suddenly acting like a free safety, Ronde closed the distance in a heartbeat, and leaped high into the air to intercept the pass! With time winding down, the Eagles got the ball at midfield. He was nearly exhausted, but there was no stopping Tiki. He pounded much bigger defenders, knocking them flat on their rear ends as he bulled ahead for yardage like a fullback. Finally, on the Bear three-yard line, with first and goal, a surprise play came in from Coach Wheeler. “Quarterback reverse!” Hayden told them. Another trick play! Hayden took the snap, faked a handoff to Tiki, then turned and ran toward the sideline, as if he were out of the play . . .
. . . except that he had the ball tucked behind his back! When Hayden snuck into the end zone, it sealed the Eagle victory at 28–21, and saved them from a terrible loss that would have tarnished their perfect season. Tiki was so happy, so relieved, and so exhausted, that only after he’d showered and changed did he realize he’d forgotten something very important. Tiki could see Manny was upset. He felt like saying, It’s okay, man—we won the game. We’re still undefeated! But he knew Manny would take it the wrong way. When people are angry, Tiki knew, sometimes it’s best not to try to reason with them. “The main thing is, you’re okay,” he finally said, clapping Manny on the back and retreating. Tiki nodded. He sure hoped Manny was right.